Synopsis: In the Community, there is no more pain or war. Implanted computer chips have wiped humanity clean of destructive emotions, and thoughts are replaced by a feed from the Link network. 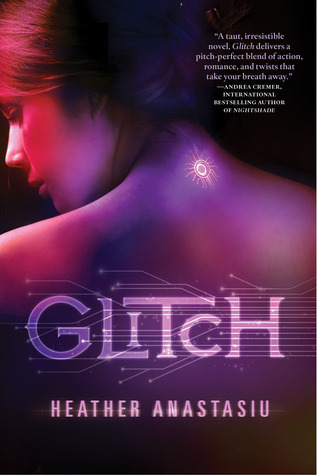 Thoughts: The first thing that drew me in for Glitch was the gorgeous cover. I love the purple and pink, the way it lights up the whole cover and yet there is still darkness in the background. And, that fits the story so well. This book literally puts color into a black and gray world. Glitch was a story where I instantly found myself falling in love with the world as Zoe discovered it. In the Community humans are controlled by computer chips. There is no pain, no color, no personal thoughts, and no differences. Everyone is a like. Zoe is different though... she's glitching. She's starting to see colors, to feel her own emotions and thoughts, she can finally see the world around her and with these glitches she discovers telekinetic powers. But Zoe is scared, she's considered an Anomaly and anomalies are to be reported and possibly deactivated. Quickly Zoe discovers she's not the only anomaly and that there is a whole world outside of hers that she is not supposed to know about. Will Zoe and her band of anomalies be able escape before they're deactivated? It's concepts like these that almost scare you. With all the technology in the world that keeps developing, isn't it crazy to imagine that something like this could actually happen? I could not imagine living in black and gray. I could not imagine not having my own thoughts and most of all I could not imagine being complete devoid of emotions. That's not the only concepts of Heather's book I loved though. I also loved the twists and turns she developed. Towards the end there was one point where it was twist after twist after bang-blow-up-in-your-face what-the-heck-just-happened moments. And, it blew my mind in the best way. 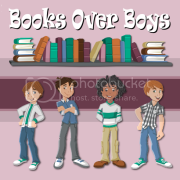 Then there's the amazing protagonists, Zoe and all the lovely boys that I loved for their own reasons. Zoe is constantly nervous, but who wouldn't at the risk of being deactivated (aka killed). But, watching her fall in love with her new world, I just adored it and I loved how she never once stop fighting for not only herself but everyone else as well. On the boy side, there's Adrien, and oh my gods I love this kid. First there are his beautiful aquamarine green eyes, his dark hair, his loving personality, and his rebelness... he's just too perfect. I completely fell for him and I want so much more of him in the future! Then the other boy who plays a big part is Maximin. At first, I really liked Max but as I got to know him... his pushiness and possessiveness turned me off. Then towards the end, I found my heart caving slightly for him because I understood why he was the way he was. But, regardless... Adrien all the way! Overall, this book was so well written and such a thrilling adventure. I loved all the elements... the discovering a world, the dystopia, the romance, and the betrayals. I cannot wait for the next book, Override! This totes sounds like my kind of book! Glad to know you liked!!! :) And I agree that the cover is stunning!